As I mentioned on my Facebook page, I recently had an email about one of Harvey's poems from Ruth Arnison, of Poems in the Waiting Room. It's an arts in health charity, based in Dunedin. "Our aim is to provide a free source of well-chosen poetry for patients waiting for medical appointments, rest home residents waiting for meals, outings or appointments, hospice patients and their families and prison inmates. The poetry cards, A4 sized three-fold cards, feature between eight and ten poems. New editions of the cards are printed and distributed every season. Poems include those from contemporary poets (especially New Zealand writers), older poems, a haiku, and poems for children. They are selected for readers’ enjoyment and are in no way a vehicle for delivering any social/health messages. The cards may be read and left on site or taken away for sharing or further reading." Ruth wanted to use "Giverny in Autumn" for a new card. Of course I immediately said yes - Harvey would have been delighted. She wrote back telling me why she'd chosen it: "I spent a month in Italy and France two years ago and Giverny was the highlight of my trip. When I came across Harvey's poem I was immediately back on that famous green bridge - how poetry can transport one." We went to France in 1999. Staying in Rouen, we'd arranged to meet two English friends, who came all the way from London to see us for the weekend. They had their car, and suggested going to Giverny on the Sunday. 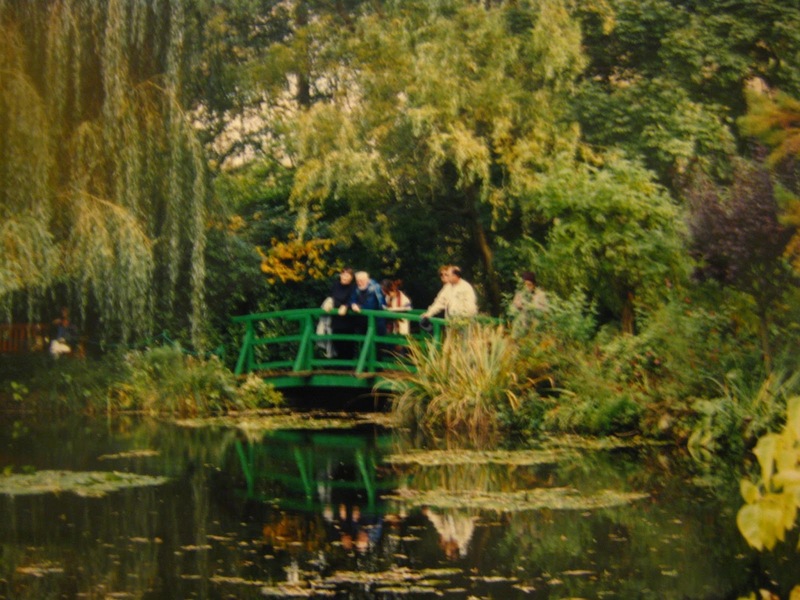 We were so lucky - it was 31 October, the last day Monet's house and garden was open to the public. But it was fine, and we wandered around hardly believing we were actually there. Our friends took our photo on the bridge. I wrote an article about Giverny later for Next magazine, and Harvey wrote his poem. weeping light into the Avon. flecked by a few late water-lilies. A frog on a pad. as they are now at its end. the copious confusion of autumn leaves. What an evocative poem, as is your story. Marvellous to see how these experiences, turned to poetry, can be offered to others in need. amidst the 'copious confusion', something emerges, a moment of grace. I love the reference to the Avon, where the willows now have so much more to weep for. Yes, they do. It was good Harvey was spared any knowledge of the dreadful second earthquake. It's wonderful to hear this news Anne - so special to think of Harvey (or his creativity at least) rippling out into future places and moments where others can appreciate him.